Now here comes “The Judge,” an unabashedly adult drama and a steadfastly old-fashioned one. Robert Downey Jr. is jaded big-city defense attorney Hank Palmer, a specialist in getting unsavory white-collar clients off the hook. As he puts it, “Innocent people can’t afford me.” He is pitted against Robert Duvall as Hank’s estranged dad, Joseph, an upstanding small-town magistrate who suddenly finds himself facing a possible murder rap and relunctantly ends up relying on his hotshot son as his attorney. You can fairly smell the passion behind this project wafting off the screen. Dobkin, whose father was a lawyer, spent a number of years in pursuit of this opportunity to prove himself as adept at serious subjects as silly ones. Studio types would look at the script and say, “But it’s not funny.” His 1998 breakout film, "Clay Pigeons," was a dark and nasty crime comedy, as black and violent as they come. But it was still a comedy. Dobkin’s persistence has paid off in certain ways, mainly because it provides both its leads with an arena in which to occasionally show off their strengths. Downey gets to engage in his trademark hyper-verbal glibness but with a black sheep’s injured sadness in his eyes. Duvall is the embodiment of grizzled authority but undercut by the grimace-inducing infirmities of old age. Yet, there also are some less welcome elements and a certain dragginess to contend with as Dobkin overloads his plot with too many bits of business on the way to a John Grisham-lite finale. Actually, make that bits of Bit-O-Honey candy, one of the many repeated visual allusions to a past that tore these two men apart. As is often the case when an artist finally is allowed to achieve his dream, the director adds unnecessary clutter – there is much ado about hydrangeas as well as an old Metallica T-shirt -- as if he fears he will never get a chance to do a drama again. 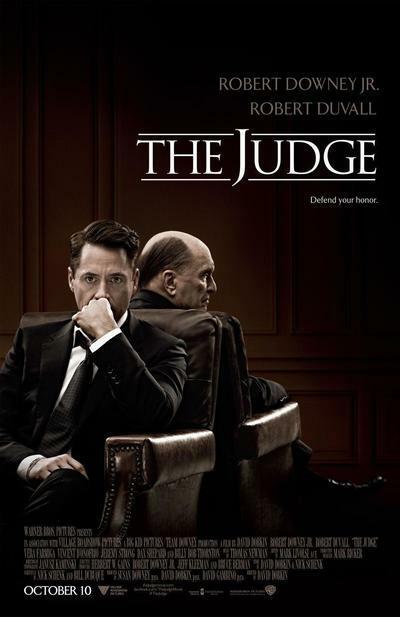 Before "The Judge"’s world premiere at the Toronto International Film Festival last month, Dobkin told the audience that he always wanted to do the kind of movie that doesn’t get made anymore. In other words, a human story. And themes found in the specific examples he cited as his inspirations -- “Kramer vs Kramer,” “Terms of Endearment” and “The Verdict” – are duly reflected in "The Judge." Downey copes with his disintegrating marriage while attempting to get closer to his dumpling-cheeked daughter as a potential custody battle looms, just as in “Kramer vs. Kramer.” After his legal shark returns to the small Midwest pond of his youth for his mother’s funeral, he and a perpetually disapproving Duvall bob and weave around each other like a pair of emotionally battered heavyweights—not unlike Debra Winger and Shirley MacLaine in “Terms of Endearment.” And there are plenty of “Verdict”-style legal entanglements as Hank is forced to represent his father while shaking out the potentially unpleasant truth behind a car accident that is considered a possible vehicular homicide. Meanwhile, a chorus line of family skeletons shake and rattle at regular intervals, some involving middle-child Hank’s brothers. And if anything is emblematic of the strengths and weaknesses of The Judge, it is these two siblings. As eldest son, Glen, Vincent D’Onofrio carries the burden of regret and responsibility on his beefy shoulders as a former baseball prodigy whose sports career hopes were dashed by an injury. As an unexpected MVP, D’Onofrio solemnly provides the perfect surefooted counterweight between the clash of the titans escalating between Downey and Duvall. Then there is slow-witted youngest son Dale, played by Jeremy Strong. His innocent questions often provide obtuse humor even if his near-childlike state goes unexplained. But too often Dale ends up being more of a device than a fully fleshed-out character as he shows new and old home movies shot on an vintage Super 8MM camera as a way of filling in the back story that haunts the Palmer clan. Vera Farmiga, whose local diner owner was cruelly dumped by Hank when they were in high school, seems almost part of a different movie. One by Frank Capra. She primarily exists to provide a sympathetic ear for Downey and some undercooked romantic relief. In fact, a whole parade of colorful performers passes by, including Billy Bob Thornton as a slim and steely silver fox of a prosecutor who battles Hank; Ken Howard as the no-nonsense walrus-like judge presiding over Papa Palmer’s case; and Dax Shepard as an unseasoned rube litigator. Ultimately, it is the core father-son relationship that is put on trial, and you have to wait until the end before Dobkin unclenches his need to control and just allows Downey and Duvall to fearlessly go at it together at full force. Still, for almost every choice that rankles – using a raging tornado as a metaphor for the storm inside the Palmer homestead is so obvious, it hurts – there usually is something else that offers compensation. Probably my favorite scene, one that shows Dobkin still has it funny-wise: When Hank, looking to cherry-pick less than salt-of-the-earth types as potential jury members, decides to ask the candidates to reveal the bumper-sticker sayings on their cars. A woman with the word “Tolerance” spelled out with religious symbols gets a thumbs down. The guy whose saying is, “Wife and Dog Missing. Reward for Dog”? He gets a thumbs up. Way up.